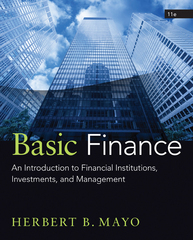 Basic Finance 11 Edition Offering the most current coverage available, BASIC FINANCE: AN INTRODUCTION TO FINANCIAL INSTITUTIONS, INVESTMENTS & MANAGEMENT, 11E uses a proven "modular" approach to help you learn finance concepts quickly and easily. Exploring how the three primary aspects of finance interrelate, the book equips you with a firm foundation in all of finance--not just corporate finance. Each chapter offers a concise, self-contained treatment of one or two finance concepts or institutions. The book's Internet resources, number problems, illustrations using financial calculators, and Microsoft Excel appendix help you build on what you learn. The time value of money is emphasized throughout to ensure a thorough understanding. The 11th Edition includes numerous self-help problems with answers and relationships with answers, new sections on Internet sources of information, and up-to-date tax laws.